Strong fuel efficiency standards make Americans' lives better. They save people money at the pump and encourage automakers to innovate so they can compete in the global marketplace. They reduce U.S. reliance on gasoline, which makes the country more independent, while cutting pollution and improving air quality. That's why the government worked with the auto industry to set new fuel standards in 2010 that called for cars to average 27.5 miles per gallon (mpg) in 2010, rising to more than 54.5 mpg by 2025. In fact, car manufacturers have already been able to achieve these standards and sell more cars. It's absolutely critical that the United States continues to reduce carbon pollution from the auto sector, which has become the biggest source of U.S. emissions today. Lowering these emissions is good for the climate and people's health. Yet, the Trump administration is on the verge of calling for a review of these standards. The bottom line is that rolling back vehicle fuel standards would take money from people's wallets and leave them with dirtier air to breathe. 1. Vehicle standards save American families and businesses money at the pump. More efficient car and truck models allow families and businesses to spend less when fueling their vehicles, no matter how high or low gas prices are. This is especially important because oil prices are volatile, and could grow in the years ahead. While gasoline prices may seem low today, they were close to $4 per gallon in many parts of the country just three and a half years ago. 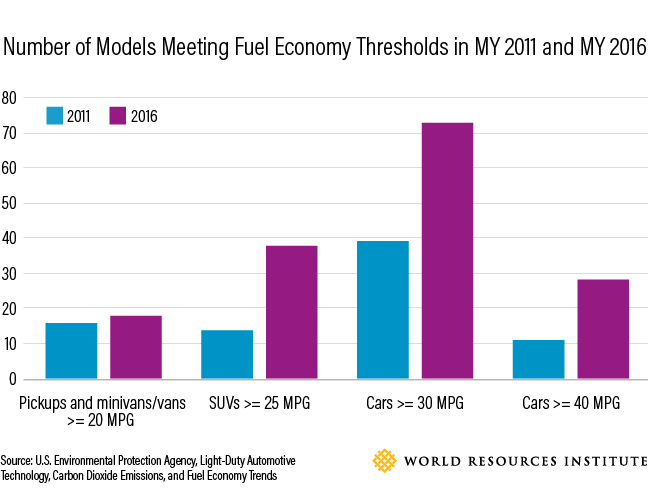 The existing vehicle standards have helped drive deployment of more fuel-efficient vehicles—over the last five years, the number of SUV models that achieve at least 25 mpg and the number of car models that achieve at least 40 mpg have more than doubled. These vehicles are saving drivers money at the pump today, and the current standards will bring even more efficient vehicles to the market over time. A recent Consumers Union report estimates that customers purchasing new vehicles when the standards are fully implemented in 2025 will save $3,200 to $4,800 on fuel purchases over the life of their vehicle—up to $8,200 if fuel prices increase. These savings matter for families and businesses struggling to stay ahead. 2. Manufacturers can meet fuel efficiency standards at lower costs than originally projected. Car manufacturers have exceeded U.S. Environmental Protection Agency's (EPA) vehicle standards in each of the last four years. There are actually more than 100 cars, SUVs and pick-up trucks available today that already meet 2020 or later standards. Automakers can already achieve EPA standards by using technologies available today like advanced transmissions and turbocharging, or by improving aerodynamics. Meanwhile, new technologies are entering the market every day, both more quickly and at lower cost than EPA and the National Highway Traffic Safety Administration (NHTSA) originally projected in 2011-2012. For example, at least one version of the nation's best-selling pickup trucks, the Ford F-150, met the 2024 fuel standards in 2015 by adopting high-strength lightweight aluminum and other advanced technologies. Its latest model is even more efficient. 3. Vehicle standards allow U.S. car manufacturers to remain competitive. Eight years ago, the American automobile industry was on the verge of collapse. Now the industry has seen seven straight years of sales gains, growing jobs and increased innovation, while also meeting more stringent standards. Weakening the existing vehicle standards could put our competitive advantage in the global economy at risk. Japan, the European Union, Canada, China, South Korea, Mexico, Brazil and India all have existing or proposed fuel efficiency standards comparable to the 2025 standards here in the United States. And, while the United States has historically been a leader in electric vehicle technology, other countries are now pushing ahead. Between 2014 and 2015, electric vehicle sales in China grew by almost 300 percent, while eight other countries saw a 50-200 percent increase. Five countries (including China and Germany) offered more electric vehicle models in 2015 than the United States. In addition, several foreign automakers have announced electric vehicle goals. Volvo is aiming to sell one million electrified vehicles by 2025; Volkswagen set a target to sell 2-3 million by the same year. With Bloomberg New Energy Finance projecting that electric vehicles will make up 35 percent of new car sales globally by 2040, now is not the time for the United States to sit back. 4. Vehicle standards promote energy security while protecting the environment and public health. Thanks in large part to significant emissions reductions from the power sector, U.S. transport is now the single-largest source of U.S. GHG emissions, contributing more pollution that fuels extreme weather and sea level rise. 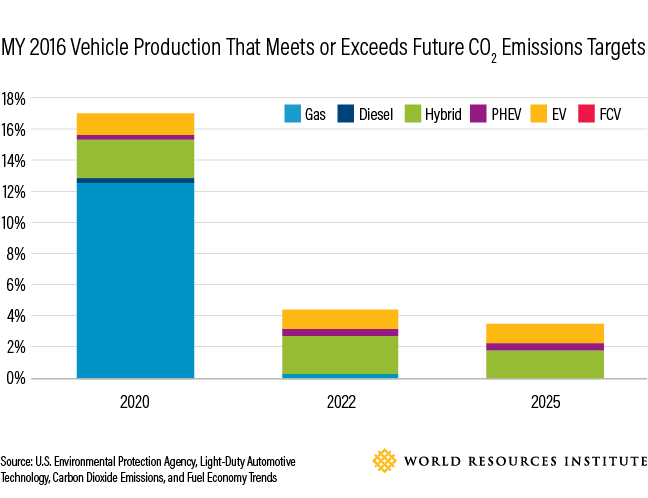 EPA's analysis shows that the 2012-2025 vehicle standards would reduce emissions of climate pollution by 6 billion metric tons, equal to a year's worth of carbon dioxide emissions for the entire United States. These reductions are expected to save consumers $1.7 trillion in fuel expenditures and provide hundreds of billions of dollars in net economic benefits. The program will also reduce oil consumption by more than 2 million barrels per day in 2025. The United States imported 2.9 billion barrels of oil per day from OPEC countries in 2015. And by increasing vehicle efficiency and reducing demand for oil, vehicle standards will curb premature deaths, childhood asthma and other serious health impacts. EPA and NHTSA estimate that in 2025, the current vehicle standards will lead to $0.9 to $2.1 million in health benefits from reduced particulate matter pollutants. We can't afford to go backward. The Trump administration should preserve the existing GHG emissions standards and swiftly finalize model year 2022-2025 fuel economy standards. Doing so would not only accelerate the nation's technological innovation, it would protect our energy security, environment and public health for years to come.